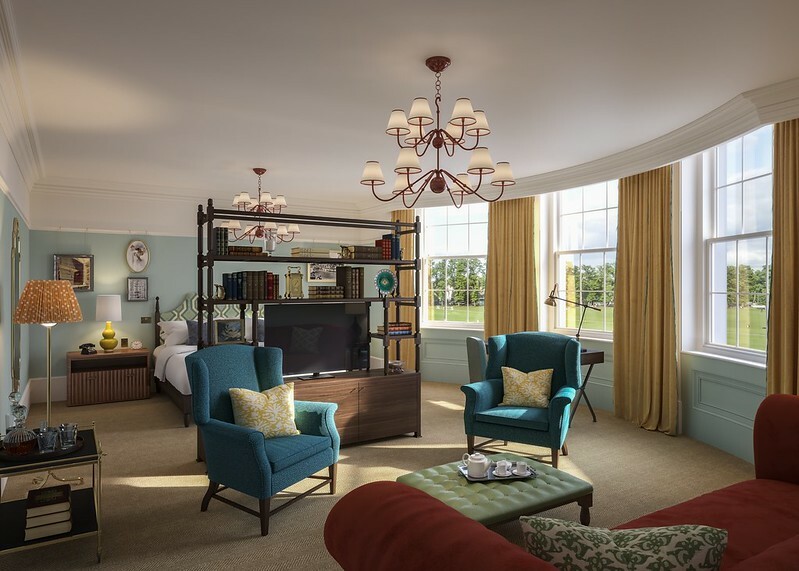 The University Arms hotel in Cambridge is finally set to reopen this summer, following an £80 million renovation project in collaboration with architect John Simpson and interior designer Martin Brudnizki. The landmark property had been scheduled to open last year, but as this article in The Cambridge News reported, the refurbishment works were delayed due to “a dispute between former contractors McLaren and hotel managers Michels & Taylor”. Ahead of the opening it has been confirmed that the hotel will join Marriott’s Autograph Collection of “boutique hotels that are unique in design and thoughtful in spirit”. The property, which overlooks Parker’s Piece, was originally built in 1834, before being extended on several occasions in the late 18th and early 19th centuries. In the 1960s “the original Regency section along Regent Street was demolished and replaced with a discordant element typical of the period”. Classical architect John Simpson – whose previous work includes projects at Buckingham and Kensington Palaces, as well as Eton College, the Royal College of Music and the University of Notre Dame – has overseen the hotel redevelopment, including the replacement of the building’s 1960s and 1970s extensions with a new Porte Cochere frontage set back from Regent Street. The revamped University Arms will feature 192 “playfully” designed rooms and suites, as well as a destination restaurant, bar, library, events space, underground valet car park and gym. The hotel is the first in the UK to “showcase Martin Brudnizki interiors from top to bottom”, inspired by “school days past, lazy afternoons spent on the banks of the River Cam and the raucous revelry of students; truly a space for locals, tourists, Cambridge students and their families alike”. Highlights include a grand, high ceiling entrance lobby with fabric fronted reception desk, a wood-burning fireplace, parquet flooring and traditional timber paneling in the library, and a bar with traditional loose rugs, statement lighting and classic bead ceiling. The hotel’s standalone restaurant, Parker’s Tavern, will offer “canteen-style seating with a mixture of free-standing dining chairs and benches, all finished in red and mustard yellow leather and dark timber”, and will be headed up by chef Tristan Welch, with British classic dishes “sourced from field, fen and England’s seas”. Rooms feature bespoke furniture and statement chandelier lighting, and “Many suites on the top floor have access to private balconies overlooking Parker’s Piece, with bathrooms located inside the original domed turrets”. The hotel and restaurant are both scheduled to open in August, with rates starting at £205 per night.